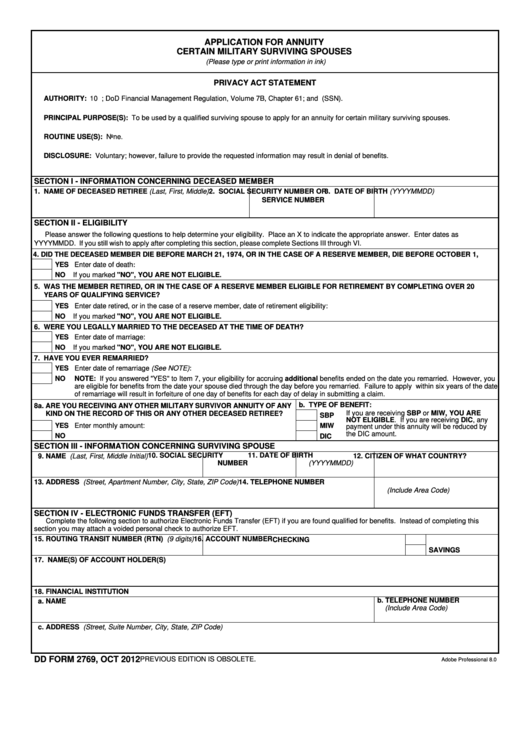 Download a blank fillable Dd Form 2769 - Annuity Certain Military Surviving Spouses Application Form in PDF format just by clicking the "DOWNLOAD PDF" button. Complete Dd Form 2769 - Annuity Certain Military Surviving Spouses Application Form with your personal data - all interactive fields are highlighted in places where you should type, access drop-down lists or select multiple-choice options. AUTHORITY: 10 U.S.C. Section 1448 note; DoD Financial Management Regulation, Volume 7B, Chapter 61; and E.O. 9397 (SSN). PRINCIPAL PURPOSE(S): To be used by a qualified surviving spouse to apply for an annuity for certain military surviving spouses. DISCLOSURE: Voluntary; however, failure to provide the requested information may result in denial of benefits. YYYYMMDD. If you still wish to apply after completing this section, please complete Sections III through VI. If you marked "NO", YOU ARE NOT ELIGIBLE. 6. WERE YOU LEGALLY MARRIED TO THE DECEASED AT THE TIME OF DEATH? 7. HAVE YOU EVER REMARRIED? of remarriage will result in forfeiture of one day of benefits for each day of delay in submitting a claim. KIND ON THE RECORD OF THIS OR ANY OTHER DECEASED RETIREE? 12. CITIZEN OF WHAT COUNTRY? section you may attach a voided personal check to authorize EFT.